TESLA played the 2nd movement of the Brahms String Quartet Opus 67, and then they were the leadership of our 18-piece orchestra to play the Faure as we sang. We are “as proud as punch” and “as happy as a butterfly on a warm day in July” to welcome Tesla back to First Presbyterian Church and to offer our community a non-ticket way to hear the world-class sound of these musicians! Linda Clark Warren, soprano soloist, holds a Bachelor of Arts degree and a Bachelor of Music Education degree from Birmingham-Southern College and a Master of Arts degree from The University of Alabama. She has been a voice teacher on the Music Faculty of both Davidson College and CPCC. Linda has been a music educator in the Charlotte-Mecklenburg Schools and Director of Music at Dilworth United Methodist Church in Charlotte. She is currently Music Director for the Show Choir and for Musicals at J.M. Robinson Middle School. She also has a Voice Studio in Charlotte and is a member and soloist with the Renaissance Singers of Charlotte. She has a rich history of singing the Faure Pie Jesu. Robert Pritchard, baritone soloist, a native of Caldwell County and a Charlotte resident since 1988, holds a Bachelor of Music degree from Mars Hill College and a Masters of Music from Louisiana State University. He has taught at all academic levels. He was the manager of the choral division of Brodt Music Company for 24 years, and he is currently Director of Music at The Dilworth United Methodist Church in Charlotte. After conducting the Festival Singers of Charlotte for 8 years, he became the founding artistic director and conductor of the Renaissance Singers, a classical community chamber choir, in 2002. This auditioned group of 36 singers presents standing-room only concerts in the Charlotte community. Renaissance also performs annually in the Duke Chapel and in the Piccolo Spoleto Festival in Charleston, S.C.
Spence Robertson, conductor, a native of Walnut Cove, holds a Bachelor of Arts in Music from Pfeiffer University and a Master of Music in Church Music from Samford University, where he worked with “anima: the Center for Worship and Arts.” In addition to serving as adjunct faculty at Lenoir Rhyne University, he is Conductor of the Catawba Valley Community Chorus and serves on the Board of the Western Piedmont Symphony. He is currently Director of Music / Organist at Zion Evangelical Lutheran Church in the Mountain View community of Hickory. For the choral parts, we adapted the brown-covered edition by Evans (published by Fitzsimons). Except for a couple of places, we followed Evans’ phrasing and breath marks. Choral copies are available from our First Presbyterian Music Library and from the Hickory Choral Society Music Library. It is the same choral edition the Hickory Choral Society used to sing the work several years ago. For the instrumental parts, we used the John Rutter orchestration of this work, which seeks to recover the original orchestral intent of Faure. The full-orchestra sound which is familiar to most of us in this work is NOT Faure’s original intention. 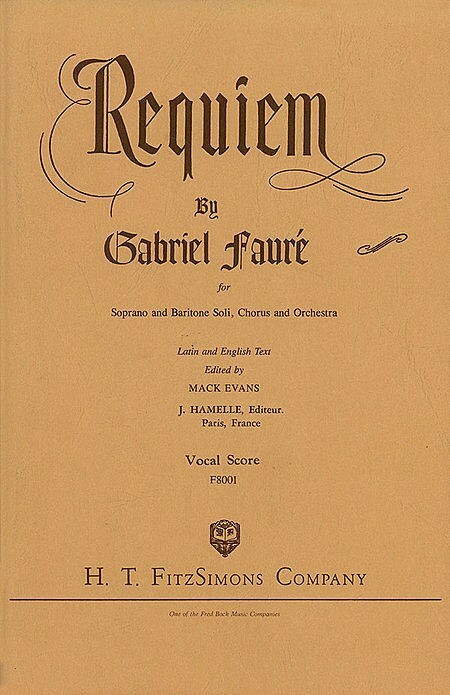 He wanted a smaller and more specific orchestra than the later edition which Faure presented a few years later for a large-scale public presentation. We like this idea because it is musically interesting (perhaps “intriguing”) and the smaller orchestra fits our worship space. In addition to TESLA, our instrumentalists are intergenerational by design: some are professionals from the Western Piedmont Symphony and from across our region; some are extremely-talented younger players from the community who will take this important music to yet another generation.